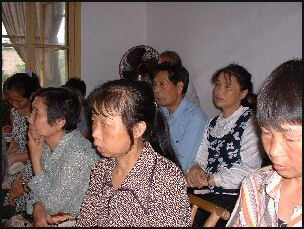 House church In China, there are nondenominational "patriotic," churches controlled by the state, and "house churches," unauthorized by the state and located in private homes, improvised halls, anywhere out of view of the government. Police often know where the house churches are located and generally tolerate them. Often the only time they are raided is when local authorities they need money---in the form of fines extracted from the worshipers. Rules are often bent depending on the relationship between Christians and local leaders. There are an estimated 1,000 unregistered churches in Beijing, including very small ones that operate out of apartment bedrooms. One of the largest is the Shou Wang house church, where 600 to 700 people attend three services each Sunday on the eighth floor of a commercial office building. Many of the house churches are linked by a secret but well-organized national network with a central committee and local cells. The organization operates discreetly (leaders often change their phone numbers every month) and in some cases receive training and funding from abroad, particularly Taiwan and the United States. Sometimes the group organizes mass baptisms of several hundred faithful in local lakes. The house church movement is especially strong in Henan province in central China. Describing a relatively large meeting, Bay Fang wrote in U.S. News and World Report, "One by one shadows slip up the concrete stairwell. Suddenly a door slides open and a throbbing hum rolls out. The room is packed with 80 middle-aged men and women squatting on tiny stools, heads bowed and eyes squeezed shut, whispering prayers. They wear the padded cotton jackets of farmers and they pray for forgiveness, for better lives, for protection from persecution. The combined sound of their worship is a low rumble, like distant thunder...They stand up one by one, weaving their way through the crowd to belt out what sounds like traditional Chinese folk tunes but are actually improvised versions of Christian hymns. The sermon is about overcoming adversity, and they read along in battered Bibles carefully covered with plastic bags." Women are at the heart of the house church movement, often leading the meetings. Describing a meeting at a house church in Qingdao in northeastern China, Terry McCarthy wrote in Time, "Carrying flashlights in one hand and Bibles in another, a small group of men and women hurried [into]...the bedroom of a private house with neither altar nor image of Jesus Christ. 'We pray to the Lord...,' intoned Guo Yan, a 29-year-old woman leading the prayer session. 'Amen' responded the 14 other people in the room, eyes tightly closed." Christians in China have been interrogated, forced to write confessions and imprisoned in labor camps for their beliefs. Leaders have been arrested for "disturbing public order" and "spreading evil propaganda to disrupt social order." Parents involved in illegal religious activities have been punished by denying their children birth certificates and documentation so they can enter school. Some Christians arrested for participating in unregistered church services have died while in police custody. Others have been tortured. One house church leader who spent several years at a labor camp told U.S. News and World Report, "We were stripped naked and made to sit outside in the freezing cold while we were interrogated for three days and three nights straight. But suffering is beneficial to us?it tests our faith and our love." House church raid Underground places of worship have been shut down and underground church meeting have been raided. The worshipers are often roughed up and handcuffed and detained and interrogated and then let go. The leaders are sometimes kept longer. Even old ladies have been kicked and beaten. The "evil cult" law passed to combat Falun Gong has been used to crack down on 14 Christian sects. Many Christians have been sent to prisons and labor camps under the law. Five leaders of Christian evangelical groups were sentenced to death in 1999. The leader of one group, the South China Church, with a claimed membership of 100,000 people, was arrested and sentenced to life in prison because his church defied rules against setting up a seminary, publishing house and bimonthly magazine. In the early 2000s, officials in the eastern province of Zhejiang boasted they had destroyed, confiscated or shut down 450 Catholic and Protestant churches and Taoist and Buddhist temples. Some had been blown up. Others were demolished with sledge hammers. In July 2006, Christians in Xiaoshan, a booming industrial suburb of Hangzhou in Zhejiang Province clashed with police after authorities tried to demolish a church labeled as illegal. Christians there had decided to build a church there by hand after waiting for months to get official approval. Hundreds of Christians gathered at the church site, with some helping to build the church and others forming a protective ring around the site. Chinese authorities responded by sending four bulldozers and several hundred trucks to tear the church down. A riot broke out as church members tried to stop the demolition. Three thousand protestors faced off against thousands of riot police, security guards and plain clothes police. Four people were seriously hurt. Eighty people were detained. Eight Christians who took part in the protests were given prison sentences ranging form one year to 3½ years. “The bottom line is that house church members believe in Jesus, not the party’s version of Jesus,” said Zhang Minxuan, a pastor and president of the Chinese House Church Alliance, who says he has been detained 41 times, told the New York Times. Many house church leaders are veterans of the 1989 pro-democracy protests who turned to Christianity in the bleak years of government repression that followed. 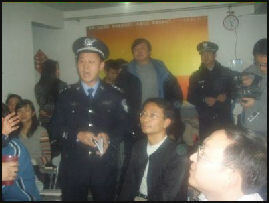 At a crackdown of a large house church in Beijing, authorities from the Office of Nationality, Religion and Overseas Chinese Affairs showed up and called the service illegal and took down the worshipers names, employers and cell phone numbers, Afterwards the members received calls from both religious officials and state-controlled work units ordering them to stop attending the services. Most refused. In the months preceded the Olympics leaders of underground churches were arrested, congregations were harassed, visas were denied foreign missionaries and places of worship were shut down. “As strictures eased during the last decade, Mr. Jin brought his congregation out of the shadows, renting space in an office building near Beijing’s university district. That same year, in 2006, lawyers in the congregation helped the church apply for legal recognition with the State Administration for Religious Affairs. With Shouwang’s doors wide open, new parishioners poured in, forcing the church to operate three consecutive Sunday services. The number of paid staff grew to 10 and the congregation started a social welfare program, delivering food to the poor and financial aid to victims of the 2008 earthquake in Sichuan Province. Shouwang’s effort to register with the government in 2006 was rejected, the church said in a statement distributed by Fu. "Shouwang is not willing to make any compromise on the stand of our faith despite that we are willing to register with the government," the statement said. "We cannot join an official state institution." In December 2009, the church bought property in northwest Beijing for regular Sunday services but government interference prevented the group from occupying the space, it said. AP reported. “Tensions escalated in April 2011 when the church was evicted from its usual rented place of worship, a Beijing restaurant. Church leaders decided to temporarily hold services in a public space, prompting police to tape off the area and detain anyone who showed up to take part, with nearly 200 people kept at a local school for several hours. A second attempt at open-air services in northwest Beijing's Haidian district resulted in the 47 detentions. In April 2011, evicted yet again from its meeting place by the authorities, Shouwang announced that its congregants would worship outside rather than disband or go back underground. Its demands were straightforward but bold: allow the church to take possession of the space it had legally purchased. Officials responded with a clenched fist.